Chocolate covered strawberries are my favorite dessert! They’re just so darn simple and delicious. 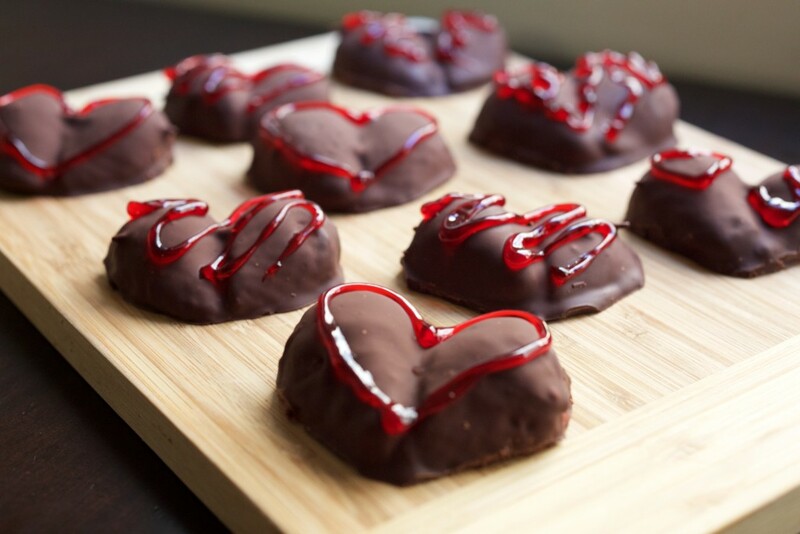 With Valentine’s day right around the corner (although I’d make these any time of the year), you now have a very good excuse to make these cute treats that taste amazing. And all you need are four ingredients, one of which is a new Reese’s spread that I found and am now in love with! So GOOD! Wash the strawberries and cut those stems off. 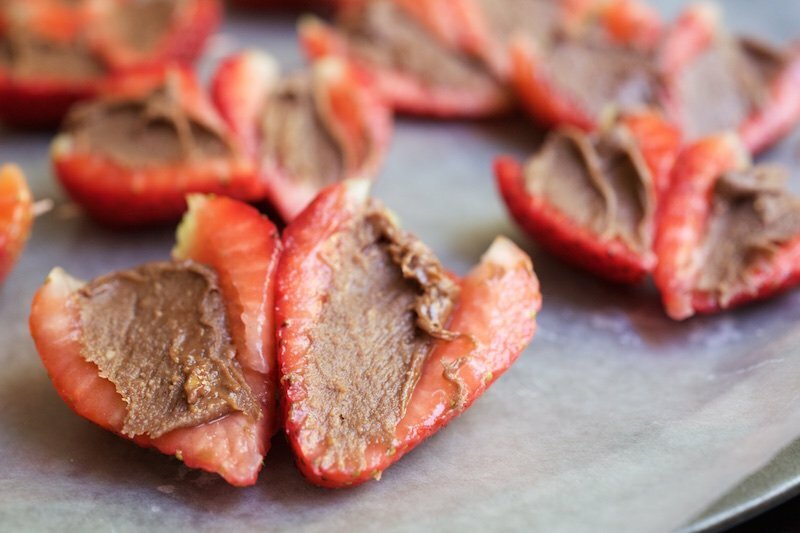 I filled my strawberries with the Reese’s spread before covering them in the melted chocolate. To make this happen, slice out most of the middle of the strawberry halves insides, cutting in a triangle. Next, take one of the halves and slice off a small portion of the lower left or right side so that it fits up against the other half to form the heart shape. Take a toothpick and poke it through both of the halves to hold the shape of the heart. Before you start lathering on some chocolate, it’s best to dry the strawberries off as much as possible. The chocolate won’t stick so great if the strawberries are wet. Melt your dark chocolate in a sauce pan on the stove, keeping it at a low heat to stay melted but not burn. I mixed in a couple teaspoons of olive oil to make the chocolate thinner as well.9. Next I used tongs to dip the strawberries in the melted chocolate. Now here is where things got a little tricky. Sometimes, because I hadn’t dried my strawberries off enough, the Reese’s spread would fall out of my strawberries into the melted chocolate! Oooops! It was a bit of trial and error but I think I only lost two halves in the batch of 13 hearts so it could have been worse. 12. Once they’re all drawn on, put in the fridge to harden up that red icing as well. 13. Now…eat as many as you want! They’re made of fruit and dark chocolate, totally healthy 😉 ! ***Just a side note make sure to remember and let people know that a toothpick is in that heart!